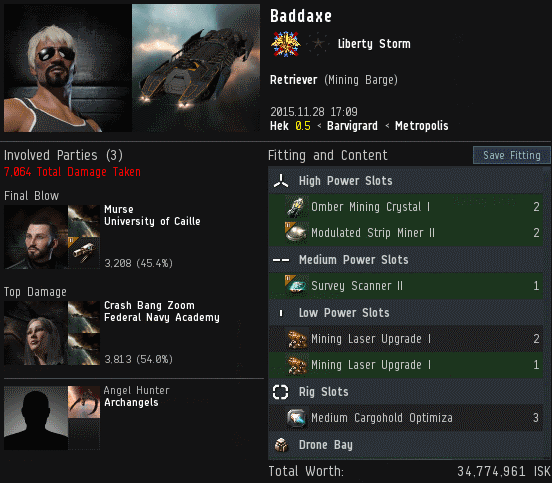 Previously, on MinerBumping... What began as a by-the-numbers permit check and wardec turned into one of the most puzzling cases of Agent Kalorned's career. A group of miners with names like Ceramir Darkspear and Teramir Darkspear lacked permits, so Kalorned wardecced their alliance, Primal Ascendancy. The alliance's leader, Lord Connir, immediately sued for peace. As they negotiated the alliance's surrender, Lord Connir informed Kalorned that the miners claimed to have permits--issued by a mysterious figure named Latir Darkspear. "When I began investigating Agent Darkspear, I was honestly quite shocked... He appeared to be a stellar member of The New Order. I gave pause, however, to something not quite right: The killboard indicated his last activity was towards the end of September. It struck me as highly irregular that an Agent who apparently became inactive in September would suddenly re-activate themselves and immediately issue 5 permits within one hour to members of an alliance that had just had war declared on them. More investigation was needed." Much has been written in many places about the New Order's elite PvP prowess and impressive killboard stats. Our enemies have even, on occasion, spoken admiringly of our "skill at propaganda"--also known as "telling the truth and letting people be impressed by it". What most don't know is that the New Order's Agents are elite in countless other ways. 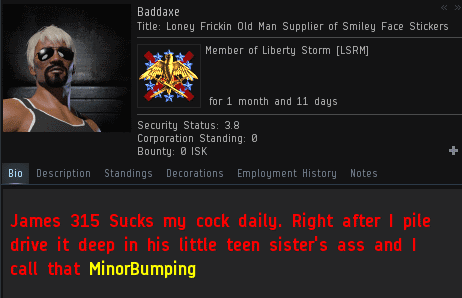 They are the most versatile men and women in EVE. There is no problem they can't solve. "Given the layers of oddities in this situation, and since this was now an investigation into an Agent of the CODE. alliance, I took off my standard Agent hat and donned my CODE. Internal Affairs one. For those who are unaware, Internal Affairs is a relatively new sub-division of the CODE. Diplomatic Team which I also head up. IA is tasked with the smooth operation of operations and relations within the CODE. alliance itself. Any issues between Agents or the alliance and its employees is routed through Internal Affairs." His proper hat equipped, Kalorned rolled up his sleeves and got to work. Curiouser and curiouser. As all this had been going on, Latir Darkspear had been offline. At the very moment Kalorned needed to speak with him, Latir materialized and initiated a convo with Kalorned. Kalorned's first impression was that Latir Darkspear was one cool customer. If Latir was pulling a con, he didn't show any signs of being nervous about it. 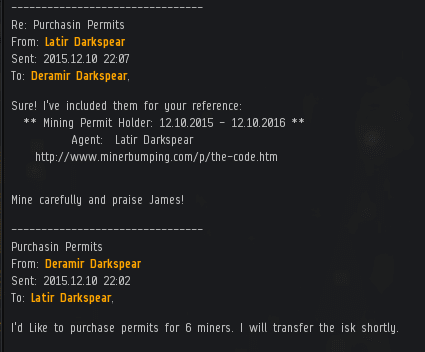 Latir forwarded a copy of what purported to be EVEmails proving that the miners ordered six permits from the alleged Agent. The timestamp showed the transaction taking place just minutes before the wardec was filed. No wonder Latir Darkspear was so confident. He had what seemed to be a smoking gun. But Kalorned wasn't entirely convinced. Not yet. When forwarding an EVEmail, it's not difficult to manually alter the timestamp. Suppose Latir Darkspear had backdated the correspondence to be consistent with his story? Kalorned wanted chat logs. These, too, could be fabricated--but not so easily or so quickly. This was an important case. If there was any subterfuge at work here, there's no telling how deep it went. Kalorned wanted every "i" dotted and every "t" crossed. Latir balked at providing his API key, which would've offered the most conclusive proof available that mining permits had been bought before the wardec. Kalorned wasn't too worried about the API key. The screenshots would tell the tale. If Latir could produce any, that is. However, Latir Darkspear began to experience some technical issues that greatly slowed down the process of taking the screenshots. Kalorned watched him suspiciously. So far, though, Latir was maintaining his composure. Kalorned suggested an even easier means of taking and sharing the screenshots. The ball was back in Latir's court. Kalorned caught a hint that Latir was sweating for the first time. The seasoned Internal Affairs chief wouldn't let up. As a reminder of the stakes involved, Lord Connir pressed Kalorned for an update on the investigation. His entire alliance was at risk. Kalorned didn't yet know how this was all going to turn out. He did know one thing, though: He was going to get to the truth, one way or another. "An otherwise slow day in December within the Derelik region, typical for the holiday season around this time, saw myself bumping the odd Procurer and Skiff away from mining range at the Gamis ice belt for lack of any gankable targets. After an hour or so a dreadful sight revealed itself: A bot-aspirant mining fleet of 4 Skiffs and 1 Orca piloted by a group of pilots with the last name "Darkspear" appeared and began mining. I had seen this gang before, and considering the light workload I had was now ready to begin advanced enforcement." The previous day, our hero inspected each miner's bio in search of a permit: Ceramir Darkspear, Teramir Darkspear--you get the idea. 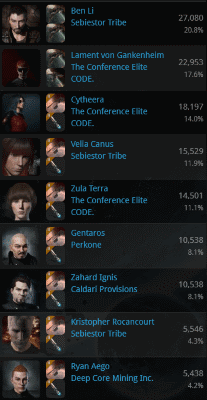 None of these pilots were authorized to mine in highsec. On occasion, our Agents use wardecs to deal with the more heavily-tanked scofflaws. The Darkspear Initiative was a member of an alliance, so the entire Primal Ascendancy was about to be dragged into war. Kalorned was familiar with the Primal Ascendancy alliance; you don't easily forget ganking a nearly half-billion isk Retriever. And Primal Ascendancy had learned to fear Kalorned. Only a month earlier, he'd ganked the better part of a billion isk of their ships and pods. As a result, Kalorned had made the acquaintance of the alliance's leader, Lord Connir. They'd spoken about the Code for a bit, but Lord Connir wasn't willing to enforce it on his entire membership. Now, thanks to the Darkspear family, Kalorned was ready to formally wardec Primal Ascendancy. Less than 30 minutes after the wardec was filed--a day before it would become active--Lord Connir contacted Kalorned. He knew the New Order Agent was too powerful to defeat and too cunning to escape. There was no need for violence; the alliance was ready to surrender in advance. Kalorned requested 130 million isk to cover the cost of the wardec plus mining permits for each of the Darkspears. 130 million isk was a small price to pay. Lord Connir had always struck Kalorned as being more reasonable than most highsec alliance leaders. Even so, it's a little-known fact that many highsec CEOs and alliance leaders secretly cooperate with our Agents and help us deal with their more troublesome members. But just as Lord Connir was about to pay the surrender fee, something unexpected occurred. Lord Connir reported that each member of the Darkspear clan had a mining permit. Impossible! Kalorned had checked them the day before. Each permit had been issued that very same day by an Agent Latir Darkspear. Kalorned's instincts told him something was up. 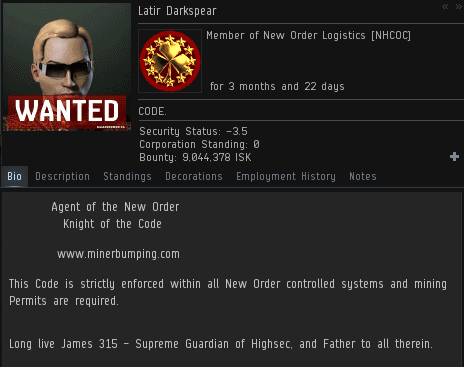 Obviously, these miners had simply put fake permits in their bio after Lord Connir told them their actions were going to bring the New Order into a war with the alliance. Plot twist! Kalorned learned that Latir Darkspear was, in fact, a member of CODE. and a self-proclaimed Agent. Surely this was some sort of trick? The deeper Kalorned's investigation went, the more amazed he became. Latir Darkspear was credited on numerous miner and freighter kills. 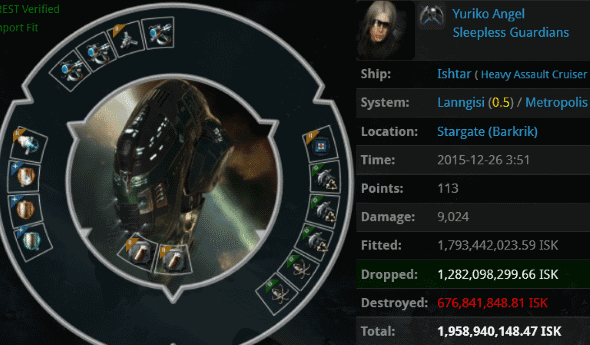 His killboard showed over 57 billion isk worth of bot-aspirant destruction! Kalorned had a true enigma on his hands. With an alliance-level wardec hanging in the balance, the stakes couldn't be higher. To enforce the Code, Kalorned had no choice but to solve this mystery. Miners sit around highsec all day, engaging in something that one would hardly call "gameplay". Yet they remain fixed in place, motivated if not entertained. It's as if they're waiting for something. ...Waiting for the New Order to save them. 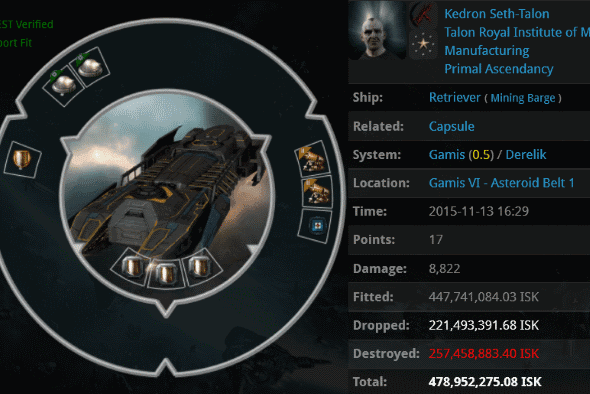 Baddaxe's Retriever and 102 million isk pod were given some unplanned excitement in Hek. 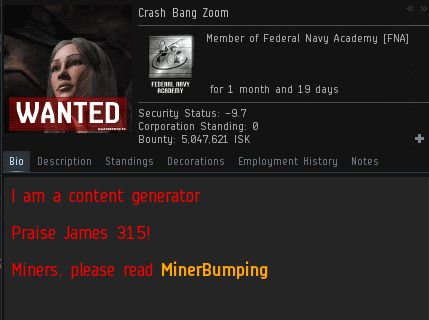 Agent Crash Bang Zoom successfully made contact with the miner. Of course, there's a big difference between contacting a miner and truly reaching him. Baddaxe began playing EVE over eight years ago. A lot has happened in that time, though apparently not much of it to Baddaxe's benefit. Still, he'd had most of a decade to accumulate resources. Now they would be devoted to the destruction of Agent Crash. Judging by the size of the bounty he placed, these have been difficult years for Baddaxe. More details surfaced. Baddaxe was "retired". People retire in games now. Either that, or Baddaxe was about to PLEX his 401(k) plan. The situation became more serious when Baddaxe revealed that he was going to make a really bad career choice. Our Agent was concerned. She knew she might need to refer this matter to a senior Agent. Although the New Order has the most effective and efficient bureaucracy in EVE, our Agents are trained to handle matters themselves whenever possible. Baddaxe was out of control. Crash had followed protocol, but the miner wasn't calming down. Was he a Goofus? To be sure, Crash prepared to invoke the name of James 315. That usually shakes the Goofuses out of the trees. Our Agent saw something in Baddaxe. Maybe the miner had potential. Could it be? Would Baddaxe grow out of this childish, rebellious phase? Or was he about to descend even deeper into the abyss? As we wrap up our Christmas celebrations and look forward to the new year, let's not forget what we've lost over the course of 2015. Although our ranks weren't thinned by permabans, we saw the end of the highsec awox era and the hyperdunk (and superhyperdunk). Yet we've gained so much: More highsec dwellers obey the Code than ever before. As for the rest, they get what's coming to them--another week of wisdom delivered by our Agents from December 20th @ 00:00 EVEtime through December 26th @ 23:59 EVEtime. 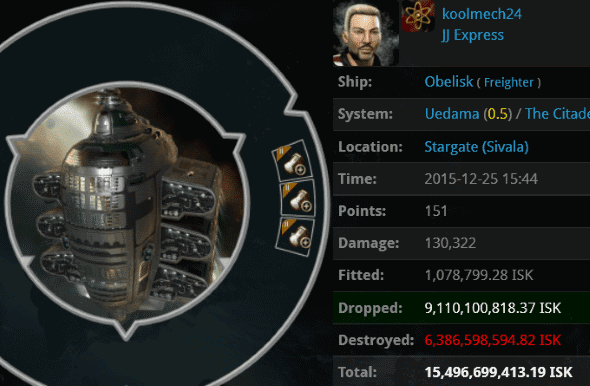 Christmas 2015: koolmech24 packed up his 15.5 billion isk freighter, set the autopilot to pass through Uedama, and let fate take care of the rest. The role of fate was played by Agents Ben Li, Lament von Gankenheim, Cytheera, Velia Canus, Zula Terra, Gentaros, Zahard Ignis, Kristopher Rocancourt, Ryan Aego, and Rex Wolfington. What's this? Hyperdunking may be gone, but Ben Li's stealth bomber alts are trained and ready to party. I like to imagine that each stealth bomber was dressed up as one of Santa's reindeer. 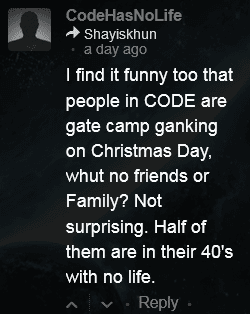 "CodeHasNoLife" couldn't be more wrong. Code enforcers do have a family. It's called the New Order family. The result: CarebearHasNoFreighter. Ben Li's drawing, above, makes a good point, though. Sometimes our Agents make an entire family by producing a bunch of alts. Judging by her cloak and impressive tank, edith sitwell had no intention of losing her 11.6 billion isk Orca. But consider the other evidence. edith lacked a permit, and she went AFK in Uedama. She didn't autopilot, either. Our Agents report that edith's Orca was simply parked near a gate for more than 30 minutes before being brought to justice. In case you didn't hear, Uedama is a no-parking zone. Agents Talon Calais, Miliana Banistaar, Jiet, Sipphakta en Gravonere, Evil Master, Engin Can, Irisz Renalard, Chocolate Mooses, Bob Painter, Nikonor Drishenko, Weeaboo Hunter, Runeme Shilter, battle Barviainen, Jayson Kusion, Schizz Popinov, Shaari Aviata, Amanantian, Jayneria, Inspector Implant, Jason Kusion, Horatius Maximus, Cipio Alduin, DwaiGuy, BAE B PEW, Izzy Plaude, Askulap Acami, Klarkus Bruume, Oh c'mon, Kiro Feras, Justin Kusion, Mike Waaargh, Joel Kusion, Jake Kusion, Jayden Kusion, Turkey Baster, Jackson Kusion, Joseph Kusion, Johnathan Kusion, Rat Orlenard, Joshua Kusion, Marbas Vinganca, and Jeremiah Kusion destroyed the Orca. Apparently this fleet also served as an impromptu Kusion family reunion. One day, after the New Order achieves final victory in highsec, a "blingy" ship will refer to one that has multiple New Order permits. Until then, bling represents decadence and costly bot-aspirancy. 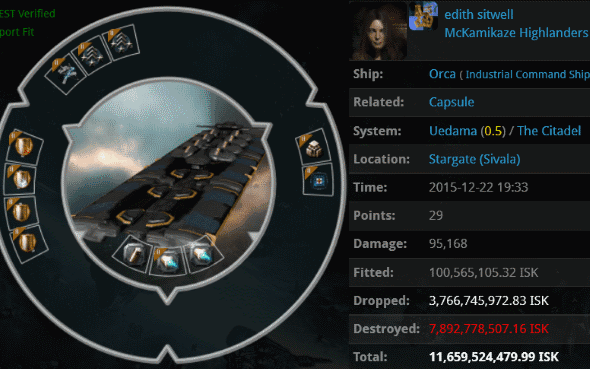 Avery Cane's immodest 3.1 billion isk battleship went AFK and went pop. 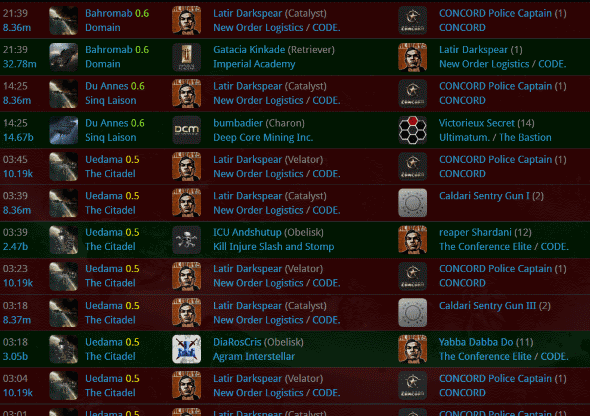 Agents Zula Terra, Salah ad-Din al-Jawahiri, Vilinensis Octoria, BAE B BLUE, V-ktor Dolus, Engin Can, Sophia Soprano, BAE B PEW, and loyalanon grabbed a nice bit of loot and shot down the 1.6 billion isk pod for good measure. 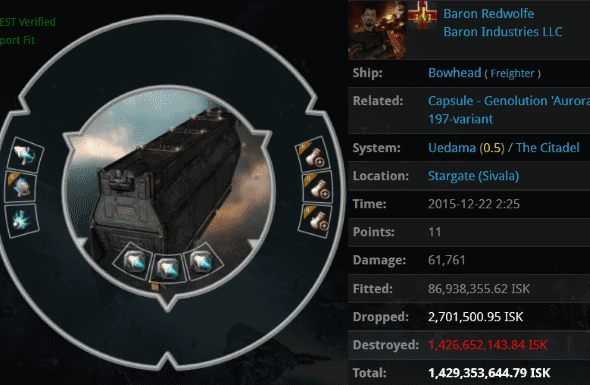 Say all you want about ships that can't shoot back, but Baron Redwolfe's Bowhead was clearly ready for some PvP. He shouldn't have cargo-tanked, though, because our Agents always have a hard counter prepared. Agents Adelaide Brooke, Zula Terra, InferiDiii, Bob Masevski, Karmafleet Is Recruiting, Sasha Cohenberg, Mr Omniblivion, Yabba Dabba Do, loyalanon, Stormy whether, Knackered Old Goat, Where-Am I, Cytheera, Fegette Drath, Chocolate Mooses, Amanantian, and Eure Dincigkeit had some pleasant PvP with the Bowhead and everyone went home happy except for the Bowhead pilot. The Ishtar has often been criticized in the past for being too versatile or too overpowered. For instance, is it unfair that a ship can use so many different kinds of drones with good damage and fit three salvagers? Yuriko Angel of Sleepless Guardians didn't exactly live up to her corp's name. Members of CODE. never have that problem. Agents Krig Povelli, hellokittyonline, Gist Warlord, Harryette Ballzack, and Yucan Blome proved that Ishtars are not invincible by any means. Arguably the Code is overpowered, but you can't buff bot-aspirancy. 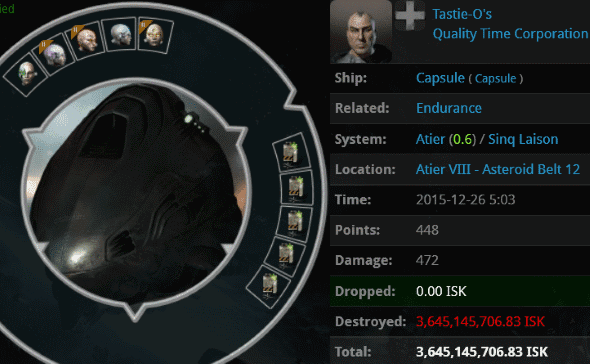 Agent Eleni Helios sunk her teeth into Tastie-O's 3.6 billion isk pod. Interestingly, Tastie-O's was flying a new type of mining frigate called an "Endurance". I was surprised how long it took for the message to get about, took a couple of years, after a while I remember seeing a null vet on the forums I think mentioning/complaining about the rise in high sec podding as if that was something bad. Then the pods on AP began declining and shuttle APing increased. Well you know what happened next, D400 killing ap shuttles :) and I have to admit to killing a few myself. Most now fly ATK and warp to 0 and real AP pod users are few and far between. Most now are empty noobs who do not know better or empty alts that dont mind being podded occasionally. But of the nice pods killed I suspect most are long time unsubbed chars resubbing and continuing as they did all those years ago, or maybe a lot of the shiny pods are ones on AP that got their ship ganked further up the pipes either by gankers of maybe faction navies. 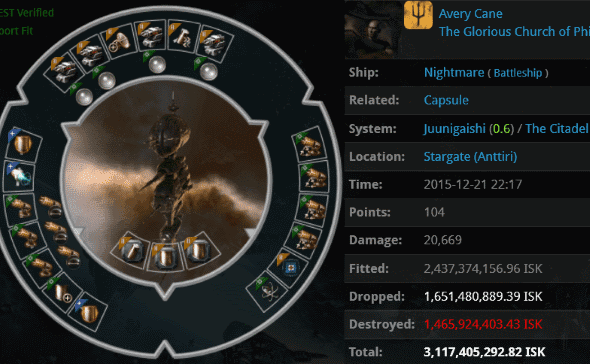 With the massive reduction of AP pods the count is increasing much more slowly, but this is in itself a victory. A victory as so few agents managed to have such a large game changing effect on the entire game universe. And it was literally only a few people. Definitely proof that the Code always wins. Year after year after year of winning. In time, there will be carebears calling themselves "bittervets" who never played EVE before the Code. The pre-Code years will be only faintly remembered as a dark age.